Until now, I had never been so repulsed by my meal that I stopped eating. So um, congratulations, Grub. You’ve earned this distinct honor. 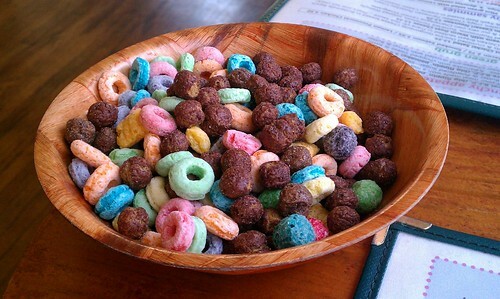 As we waited for food, we were given complimentary Fruit Loops and Coco Puffs to snack on. CUTE POINTS at least! I ordered the OOH LA LA! Egg Sandwich and it was anything but ooh la la. Overall, the sandwich was extremely bland with the only flavor coming from the Sweet and Sassy Bacon aka “crack bacon” by the masses. I definitely did not get the hype of the bacon and actually found it a bit odd – one piece was only sweet, the other piece was sweet and spiced with cumin(?). SO CONFUSED. Was this a mistake? Drenching the sandwich in maple syrup didn’t make it any better either. I KNOW. That’s how bad this sandwich was… even bacon and maple syrup couldn’t save it. 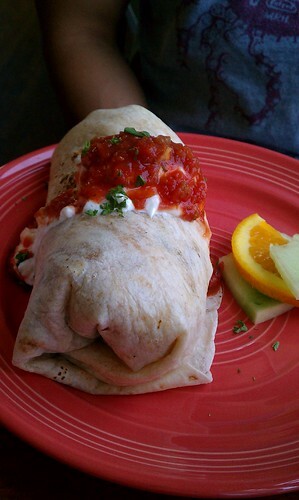 Henry’s dish, Mamacita’s Breakfast Burrito was just as bad. Sure, it looks big, but it was mostly filled with bland, scrambled eggs. If Grub wanted to stuff the burrito with cheap fillers, they should have done so with the roasted potatoes because they were actually tasty! I’m not sure if I’d be willing to give Grub another try. I already wasted $40. 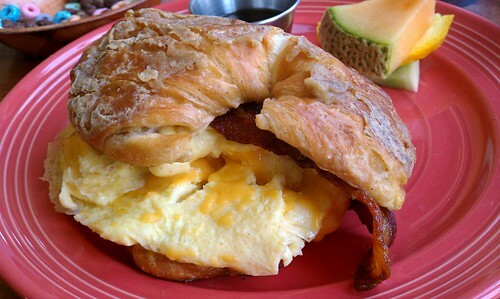 This entry was posted in this girl eats and tagged brunch, Los Angeles. Bookmark the permalink.